Animal Tissues. Nervous: ependyma. Atlas of Plant and Animal Histology. 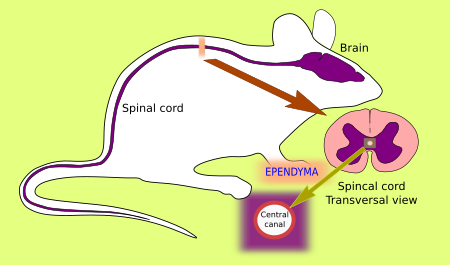 The image is from the spinal cord ependyma. 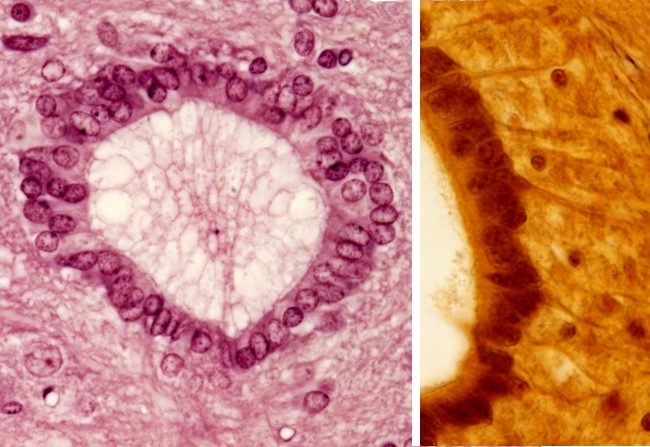 Technique: haematoxylin and eosin (on the left) y silver impregnation (on the right), 8 μm thick section, paraffin embedding. In the brain and spinal cord there is a cavity filled with cerebrospinal fluid. In the brain, this cavity is divided into chambers known as ventricles, whereas in the spinal cord there is one long cavity referred as central canal or ependymal canal. The ventricular surfaces are lined by the ependyma, a layer of cuboidal cells which act as a barrier between the cerebrospinal fluid and nerve tissue. In some dorsal regions, there is no ependyma but the choroid plexuses (which, by blood filtration, produce and release the cerebrospinal liquid). Some ependymal cells, which are known as tanycytes, give rise to basal processes that extend to the vicinity of the pial surface.